New model connects the origins of very high-energy neutrinos, ultrahigh-energy cosmic rays, and high-energy gamma rays with black-hole jets embedded in their environments. 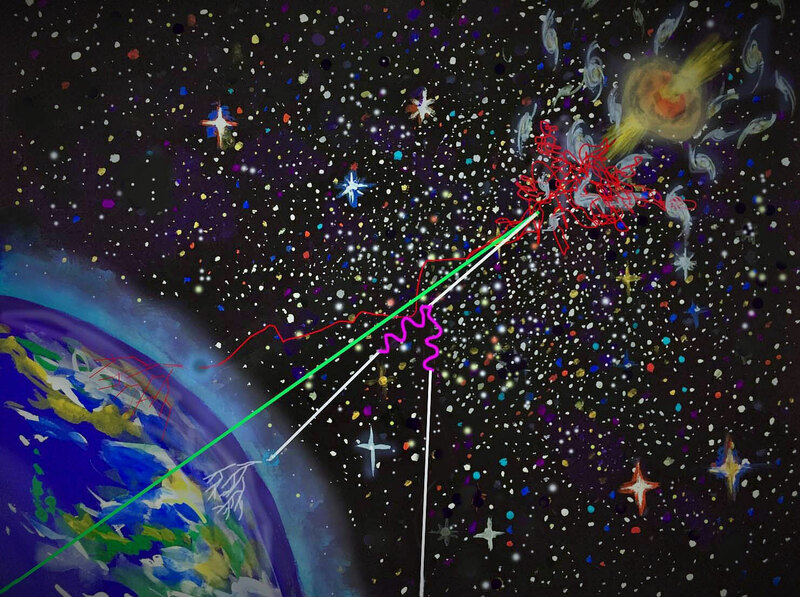 The model explains the natural origins of all three types of “cosmic messenger” particles simultaneously, and is the first astrophysical model of its kind based on detailed numerical computations. A scientific paper that describes this model, produced by Penn State and University of Maryland scientists, will be published as an Advance Online Publication on the website of the journal Nature Physics on January 22, 2018. Ultrahigh-energy cosmic rays are the most energetic particles in the universe — each of them carries an energy that is too high to be produced even by the Large Hadron Collider, the most powerful particle accelerator in the world. Neutrinos are mysterious and ghostly particles that hardly ever interact with matter. Very high-energy neutrinos, with energy more than one million mega-electronvolts, have been detected in the IceCube neutrino observatory in Antarctica. Gamma rays have the highest-known electromagnetic energy — those with energies more than a billion times higher than a photon of visible light have been observed by the Fermi Gamma-ray Space Telescope and other ground-based observatories. “Combining all information on these three types of cosmic messengers is complementary and relevant, and such a multi-messenger approach has become extremely powerful in the recent years,” Murase said. The leading suspects in the half-century old mystery of the origin of the highest-energy cosmic particles in the universe were in galaxies called “active galactic nuclei,” which have a super-radiating core region around the central supermassive black hole. Some active galactic nuclei are accompanied by powerful relativistic jets. High-energy cosmic particles that are generated by the jets or their environments are shot out into space almost as fast as the speed of light. 1 Comment on "New Theory Reveals Unified Origin for Extreme-Energy Space Particles"
Outflows are ubiquitous in astrophysics. Despite different sizes, velocity and amount of transported energy, luminosity and degree of collimation, they have obvious morphological similarities. However, what is important for us, there is the picture of the outflows from everywhere and none of inflows into somewhere. That is an obvious asymmetry.